The other resident genius at the event was Jonathan Hajdu (jonathan@hajduwines.com), the associate wine maker at Covenant Winery, and is also the wine maker for wines from the Brobdingnagian and Besomim wine labels. The Brobdingnagian/Besomim winery is located in Napa CA. 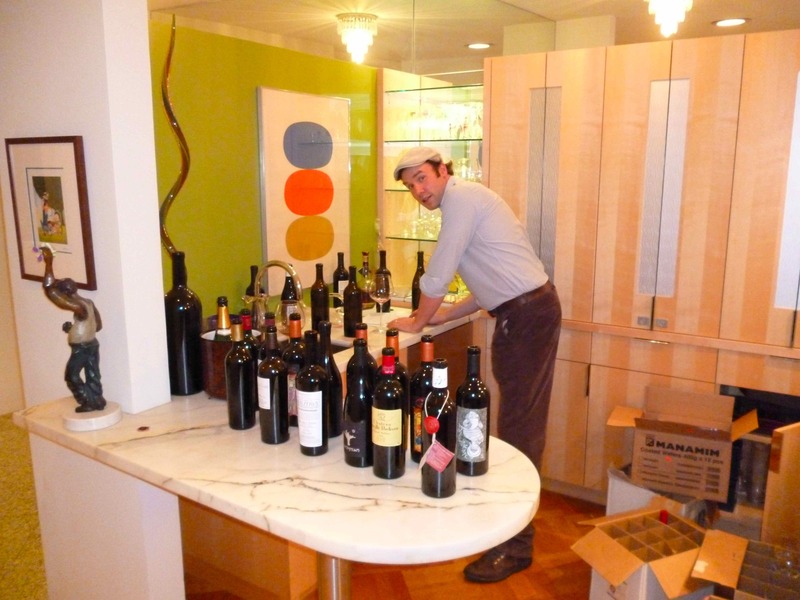 Hajdu wines was started in 2007, by owner and winemaker Jonathan Hajdu. Hajdu produces small lot artisan wines, with a focus on Rhone varietals under the Brobdignagian, and Besomim labels, though the newer wines are veering all over to where Hajdu can find the highest quality grapes. The Brobdignagian name is derived from Jonathan Swift’s giants, in Gulliver’s Travels, and attests to the winemakers’ proclivity towards intense and powerfully flavored wines. 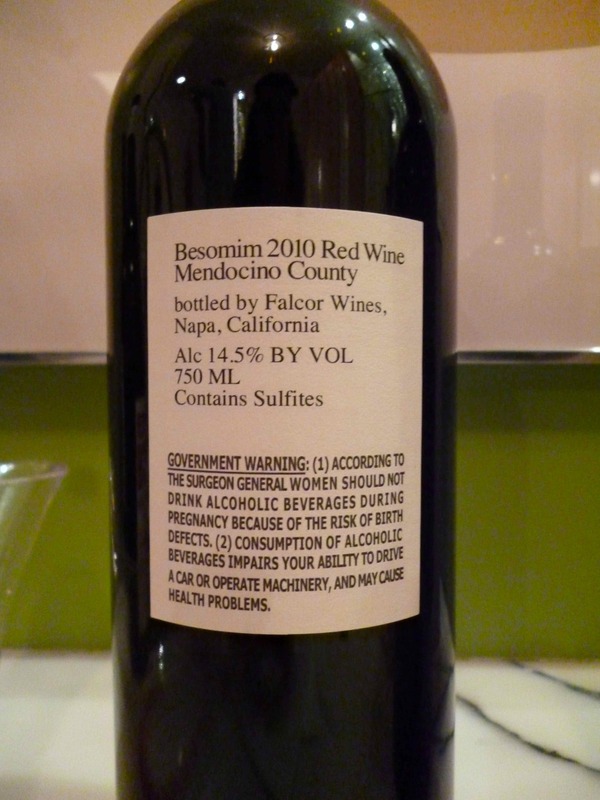 Wine produced under the Besomim label, is a blend of varietals with a focus on complex aromatics. These limited production wines are available directly from the winery. 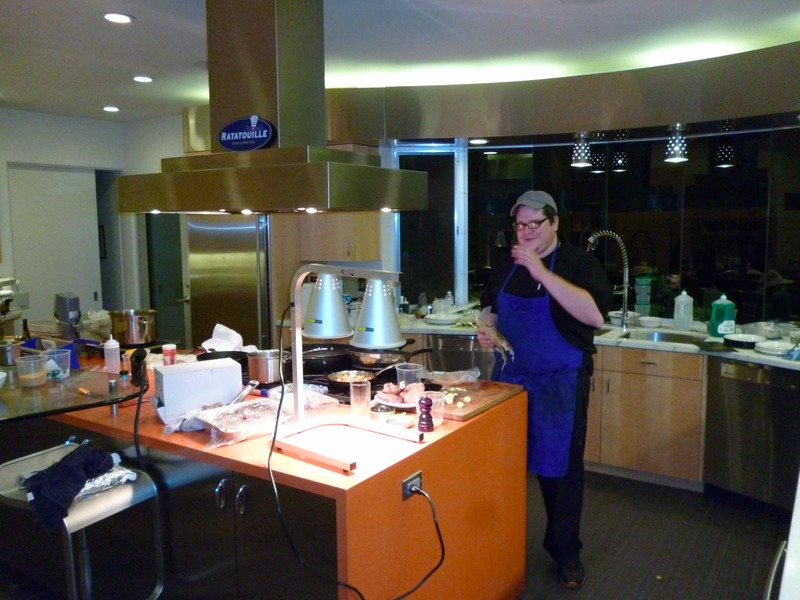 If the host and hostess were the XO of the event, and Mr. Bernstein the culinary captain, than Jonathan Hajdu would surely be both the associate steward and head sommelier of the evening. Hajdu was comfortable, both around the wine bar and the kitchen, moving effortlessly between the two domains and the table, as he poured each and every wine to the quickly trained Pavlovian patrons. It took little effort to nurture our undivided attention, as he continuously plied us with a non-stop parade of grade A substances. The quality and precision pairings were again not lost on the event’s benefactors, as one could hear an almost unending chorus of oohs and aahs as each wine was paired almost to perfection with the dish that graced the table. The fine nuances pairing smoke with smoke, spice with spice, sweet with spicy, or earthy/meaty with savory – was assuredly not lost or wasted on the table’s gourmet palates. With the nonstop gourmet frontal attack that was truly the definition and reality of this extreme culinary affair – it was almost difficult at times to stop and truly appreciate and be mesmerized by the minute details that went into every single detail of the environment, the plating, the plates used, the culinary treats, and the wine pairings. I can personally state that I understand and appreciate, that we were one of the very lucky few that experienced a once in a lifetime culinary marvel and in doing so, has probably ruined ordinary food for me forever. As you read the experience of the dishes below, you will find a common theme throughout the dishes – balance and restraint. Some of the dishes could easily have been driven in one direction or another, allowing one or more of the ingredients to dominate or take control of the palate. Instead, almost in every dish, fish, vegetable, fowl, or meat, the ingredients were in constant balance, control, with an eye towards highlighting a particular flavor, experience, or letting the main ingredient speak for itself – quite impressive. One other note, please understand that the number of bottles served blow my mind. Sure, I know of and have ben part of many events, the Gotham Wine Event VIP Sessions, and the early IFWF events where the number of bottles opened were obscene. However, here, the bottles were crazy expensive, opened for the interests of 10 to 12 people, and in the end, the bottles were mostly half empty. I state this because I tasted all of them, and having the kindness and courage to open 22 or more bottles for a dozen folks truly shows how wonderful and over-the-top this entire event was. Another note, most of the reds were double decanted. Meaning that the wine was decanted to start, than poured back into the bottle. This was done for many of the wines, as there were not enough decanters, for the sheer and insane number of bottles that were opened ahead of time. I state this because these wines were opened well in advance of their consumption and they showed extremely well for that reason. So, if you wish to enjoy these wines, almost all the reds will need some serious decanting as many of them were young or closed to start. That said, one or two wines really did change drastically, according to Jonathan, and I will note that when we get to those. My many thanks to the hosts, the chef, and Jonathan for their kindness, hospitality, wonderful food, and wine. The first two courses was a double-up on a single plate (so this was really course one and two). There was an upscale and urbanized ode to the Sunday Brunch everything with lox. The everything bagel spice covered salmon was from a Sockeye Salmon loin, and it truly melted in your mouth. 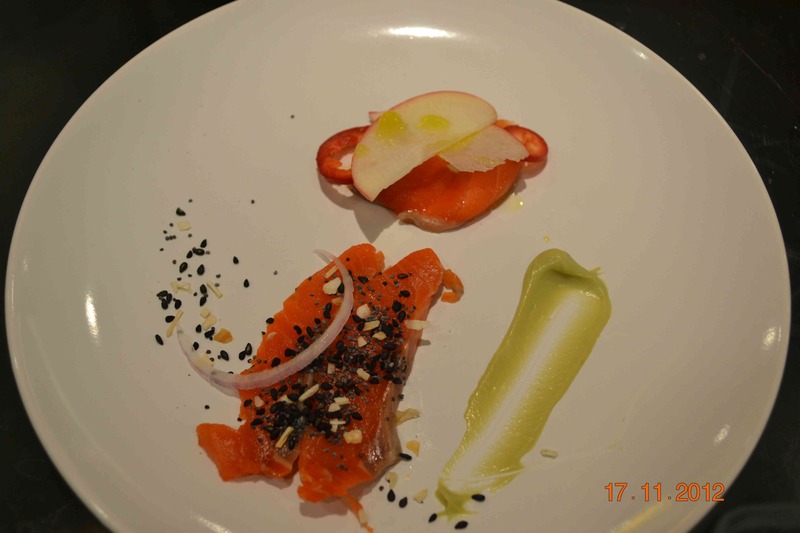 The other dish was a salmon belly with chilies, slices of pink lady apple and avocado creme. The salmon loin melted in your mouth, showing its freshness and the everything bagel spice added flair of everyday to the dish, quite an interesting turn of pace, and a lovely start to the meal. The belly was rich and oily with a slight hint of salmon flavor, that was tempered by the combination of hot sliced jalapeno chili, and the pink lady apple that balance each other, while allowing the fish to be the highlight. The dish tasted spicy, but the fish was the star and the balance was impressive. The dish is raw, clean, balanced along with sweet and spicy overtones. 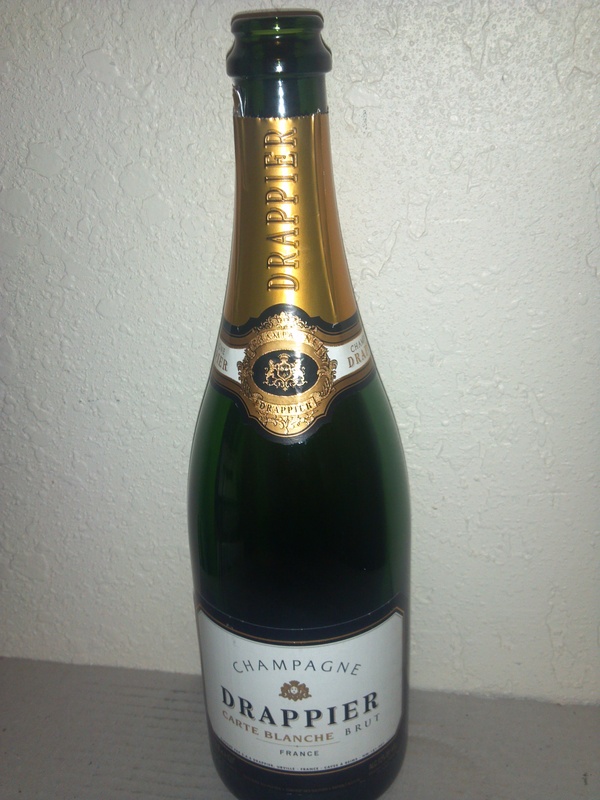 The dish was paired by a bottle of my favorite Champagne – the Drappier Champagne. My note from a year ago stands firm – a lovely rich, ripe, and enticing Champagne. The third course showed off a different Pisces and it was a winner. 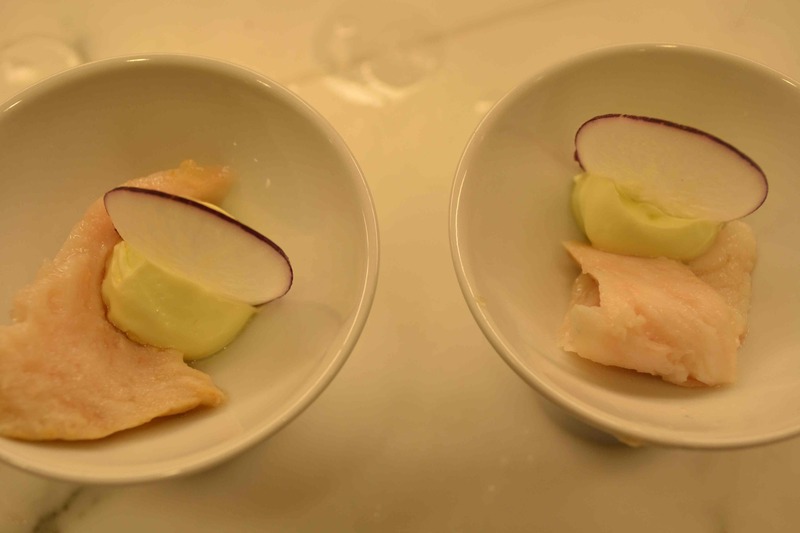 The dish was lean Hamachi with lemon oil, and horseradish, and was paired with some 2010 Covenant Chardonnay, Lavan. The fish was lovely and balanced perfectly with the lemon oil. We have enjoyed fatty Hamachi many times, but this dish was more controlled coming from the leaner part of the fish. The lemon oil added some coating flavor to the fish, but again, the chef’s desired highlight was the fish. The horseradish added some zing, a theme in many of Bernstein’s dishes, and one that added to the highlighted fish. The wine pairing here was a true delight. 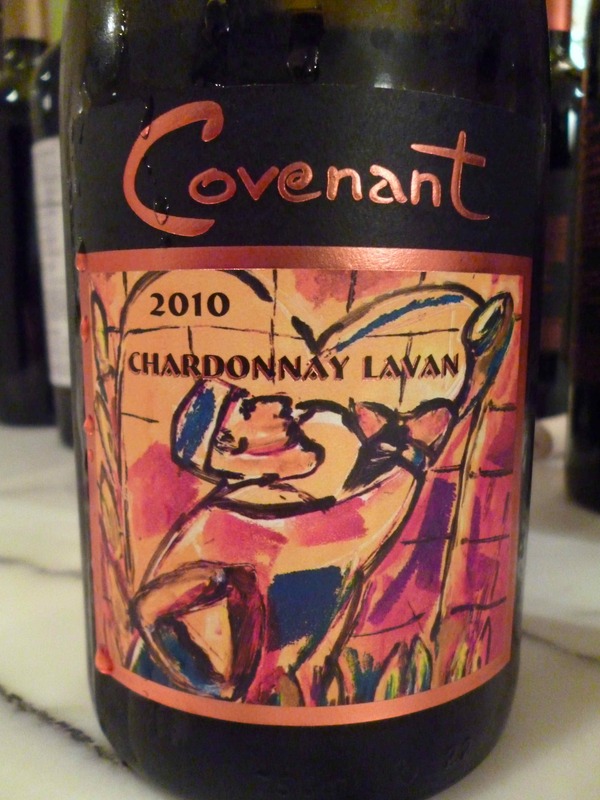 The 2010 Covenant Chardonnay, Lavan showed off lovely ripe fruit, ripe melon, grapefruit, green apple, brioche, and tart lemon. The mouth was lovely with rich toast, baked apple, caramel, oak, pear, and lovely tart fruit. The finish is long and spicy, with butterscotch, pear, and quince lingering long. The fourth course showed off yet a different Pisces and it was another winner. The dish was lean yellow fin tuna Maguro. To many who see this dish they may imagine that the main highlight for this dish is the lovely maguro, and of course they would be correct, but there was another surprise of this dish, and that was the fresh and distinctive chickpea. The fresh chickpea was crazy fun but the spice on the fish allowed for a fresh, bright, and lovely dish. The fish was lean – but still showing is color with nice controlled fat, but balanced with lovely vanilla and floral flavors from the fresh chickpeas, that melds and melts in your mouth! 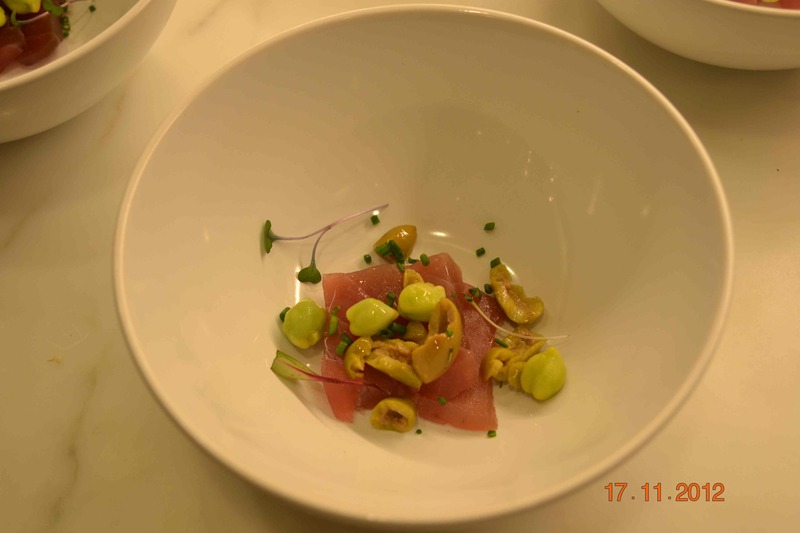 The dish was topped with micro greens, olives, and chives that help to round out the flavors, but the chickpeas and fish were Bernstein’s clear highlight for the dish. The wine was aired out in advance and that helped it wine popped out of its funk to create nothing short of heaven. 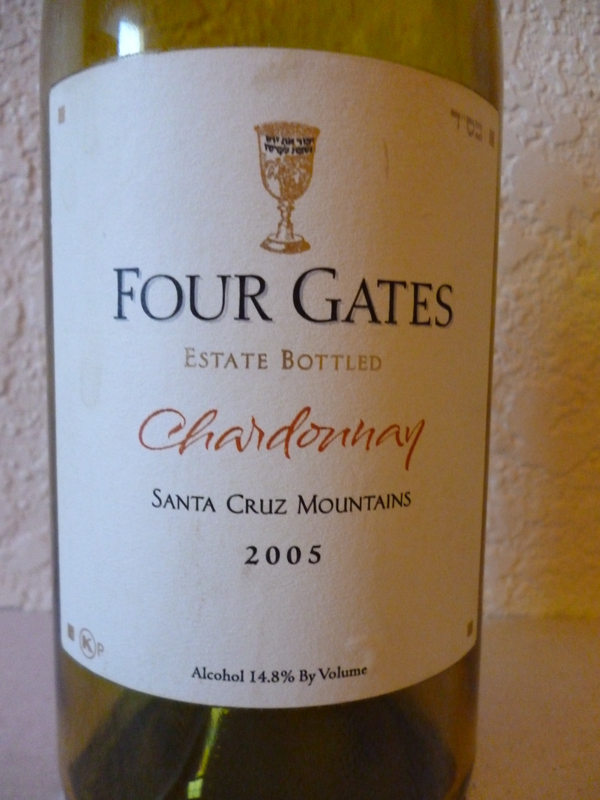 The wine nose is redolent with lovely butterscotch, melon, rich butter, peach, and apricot. The mouth is full bodied, rich, and layered with rich ripe summer fruit, lemon, floral hints, Asian pear, and mango, all wrapped in good acidity and toasty oak. The finish is super long with smoky notes, caramel, nice butterscotch, with a touch and finish of cut grass vanilla. The fifth course continued the tuna theme, and once again it was a winner. 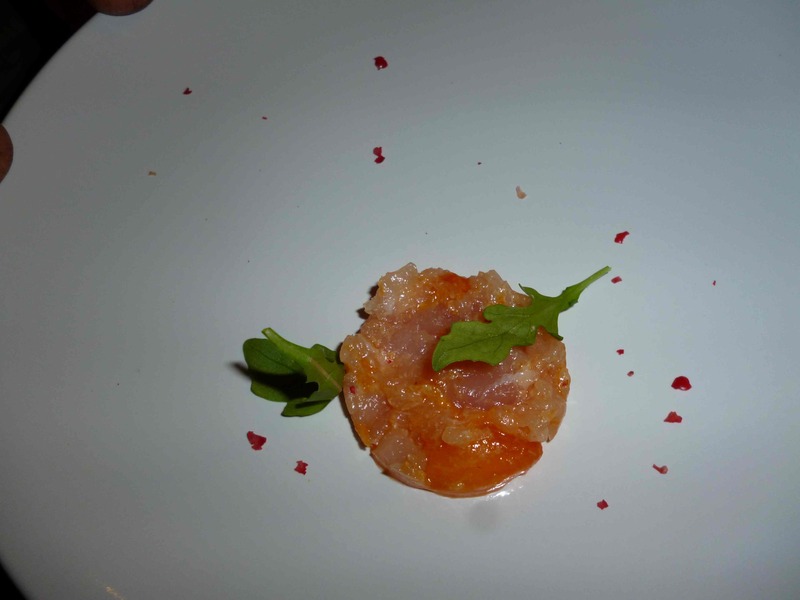 The dish was lean Albacore tartar, along with Hayashi persimmon, yuzu peel, pink peppercorn, and Arugula. The tartar was bright, fresh, with nice fish flavor, tempered with the lightly sweet Hayashi persimmon, and the pink peppercorn. The yuzu peel was a lovely twist as well, but the clear focus for this dish was the tartar itself, essentially the entire dish. Tartar is one of those love/hate dishes. Some folks are not interested in eating chopped up fish, but to me, the tartar dish which is just chopped fish – is a real let down. This dish is quite the opposite, by adding in the persimmon and topping it with yuzu peel and arugula, makes for a balanced, fresh, and lively dish. This wine was one that did not show as well during the meal as it did later in the evening, so this one is a case of needing more air. Originally the wine was closed and lacking complexity. However, with more air it opened quite nicely, and tasting very much like I remembered it in Israel, a year ago. This wine is a blend of 50% Chardonnay, 25% Sauvignon Blanc, and 25% Viognier. Those that read this blog know my deep love for all things Viognier. It is quite lovely that this wine seems to find a way to embrace all these fruit and their characteristics, without killing the other varietal notes, quite a good blend and an accomplishment. The wine was aged in French oak for 8 months and it shows in the nose and the mouth. The nose on this wine starts off with rich toasty notes, nice apple, lemon, creme fraiche, brioche, gooseberry, guava, and lovely Viognier style floral notes. The mouth is full-bodied, plush and creamy, almost supple with light toast notes, nice honey notes, kiwi, ripe and crisp peach, oak, and bitter almonds that make for a unique mouth feel. The finish is long and luscious with nice vanilla, butterscotch, slate, and minerality. This is a wine that shows a controlled use of oak, along with lovely notes from each of the varietals, especially the floral and honeyed notes from the Viognier, and ripe lemon, gooseberry, and kiwi from the Sauvignon Blanc, along with the brioche, creme fraiche, apple, guava, from the Chardonnay mingling with the oak in a unique and luscious mouth. Get this before it is all gone. Drink in the next year or so. After five courses of Pisces, Bernstein threw a change of pace with a technical tour de force of apple-smoked melon, rolled cucumber, finger lime caviar, and micro cilantro. The smoked fruit – was done via a smoking machine using smoked apple wood chips. 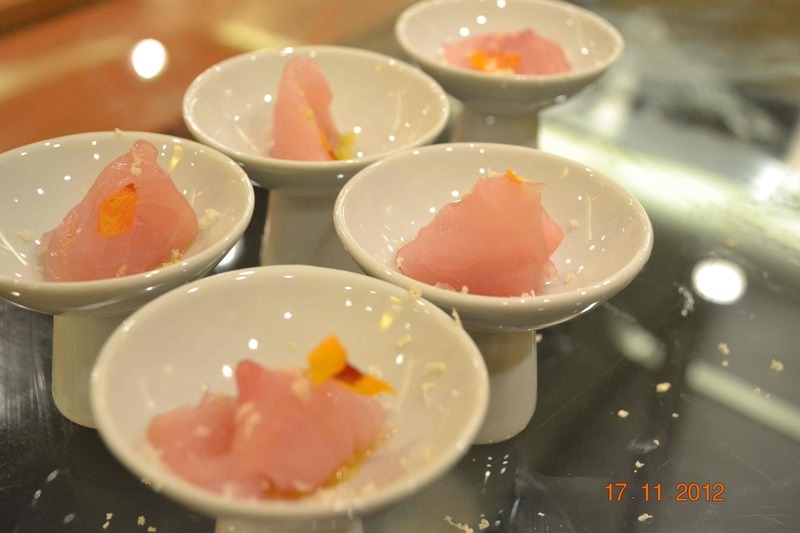 The dish came out in cellophane wrapped bowls, which was used to hold the flavored smoke in and to keep them over the fruit – till it was time to enjoy the dish. When the serving folk came and brought us the dish, they carefully removed the cellophane and the room filled with physical and aromatic smoke that assailed all my senses – and essentially disallowed all of us from smelling the lovely and unique wine. However, within a few minutes the smoke aroma dissipated and I could finally smell the lovely wine that Jonathan was so kind to share with us. The dish was paired with cucumber, micro cilantro, and finger lime caviar. The clear dish highlight was the smoked fruit and cucumber and once again the dish’s accoutrement were there to balance the dish. As many of you know, I strongly believe that cilantro is the devil’s spawn and was placed on earth to torment people like me. I am fine with that and I can taste cilantro in a dish – from miles away. However, I was not bailing on any dish this night, and good news! If any one of you hate cilantro as much as I do, micro cilantro has the taste, but without the annoying kick that totally makes me want to yack! So, yeah there was the annoying notes of cilantro, but the dish was only slightly marred to me, as there was just a touch of it that I ate, and the rest of the dish balanced lovely between the smoke notes, sweet fruit, and the lovely tart/ripe/citrus flavors from the fantastic finger lime caviar. 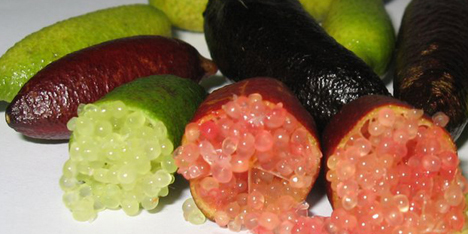 In case you have no had the chance to enjoy finger lime caviar, please go out and search for it at your local farmer’s market! The flavor is ripe, tart and concentrated – given its extremely small delivery mechanism. The combination is a striking and shocking experience; the mouth is tart, ripe, and smoked all at the same time – quite original. The smoked jalapeno slices were also quite original and balanced the sweet ripe fruit quite nicely. To pair with this dish, Jonathan Hajdu opened a not yet released bottle of the 2012 Brobdingnagian Grenache Blanc – what a lovely wine. Sorry there is no photo of the wine as the bottle was pre-release of course, only a few months into its barrel aging. WOW That is what I would first say, followed by – I hope there is a lot of this wine, because it will disappear really quickly. The nose explodes with rich toast aromas, followed by lovely floral aromas, ripe lime, lemon, grapefruit, jasmine, lovely cut grass, and herbal notes. The mouth is ripe and medium bodied, with nice lemon friache, good strong and balancing acid, and ripe peach. The finish is long and spicy, with hints of banana, ripe fig, and nice controlled buttered toast. For the seventh course Bernstein returned to his Pisces inclinations, where he would stay for another three rounds. The courses at this point were following a logarithmic curve that went up and away on the richness Richter scale. Most would not think that Mackerel was rich and oily, but actually Mackerel is very high in Omega 3 oil. The oily fish was mouth coating and to add to the story, it was caught off of Spain, shipped to Tokyo where it was weighed and sold for its richer qualities, and then shipped to California – where Bernstein and clan bought it and brought it to our table – talk about cool! 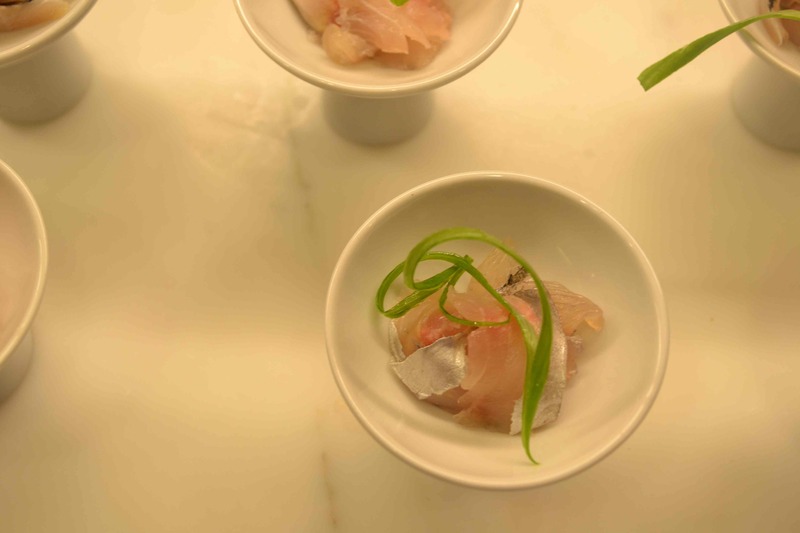 The Aji Mackerel was served simply in a bowl with scallion and Ginger. The fish’s trademark oily texture gave way to the ginger’s tart and earthy notes – while the scallion’s bitterness balanced the dish once again. This dish to me showed the deft hands of Bernstein in his ability to take it easy and show technique within a restrained dish – quite cool. To pair with this oily and mouth coating dish, why not pour a wine that is equally mouth coating and red! Yes, with the controlled dish in the house, I was shocked to see a red wine poured! To be partially honest, I was surprised that Jon even as many whites as he ended up pouring, and that he did not go red earlier. There was one more round of white wines, but that was for one of my favorite dishes of the night – more on that later. Bernstein, explained that the fish is mild in flavor, hard to work with as it is soft to the touch, almost mushy. However, in the mouth it melts and was firm to the bite. The dish was mixed with sugar, salt, ginger, and the scallion. 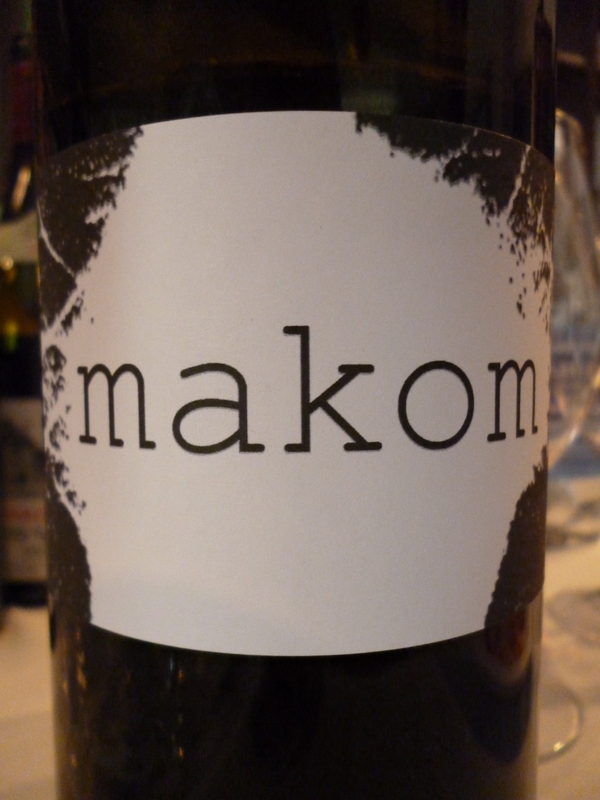 To pair with the Mackerel, Jonathan poured a glass of the 2011 Makom, made from carignan. I last tasted this wine in August at Andrew’s house, where Jonathan brought the wine to taste. The wine is made from 100% Carignan, and the earthy notes and rich fruity flavors are pervasive and captivating. The combination of the fish and wine were lovely and a precursor to the red wine evening that was ahead of us. It was one of the participants that said, how shocked they were that a red wine would go so well with fish. Given the weight of the Makom and the heft and fat content of the Mackerel, it was a lovely pairing. The wine is lovely with aromas of white pepper, floral aromas, kirsch cherry, raspberry, and candied fruit. The mouth is medium bodied with nice currant, plum, nice balanced acid, crazy spice, and more floral notes. The finish is long and spicy, with vanilla, watermelon, fig, jammy red fruit, spice, loamy earth, mineral, and what can only be explained as liquid joy. For the next course, the fat content continues to rise and the weight of the fish continues to rise as well. This time the Pisces of choice was a chunk of blue-fin tuna, a fish that is under protective custody, but one that is allowed out if they are bought at professional chef fish market. This blue-fin was medium fatty, which means fatty given blue-fin’s fat content. 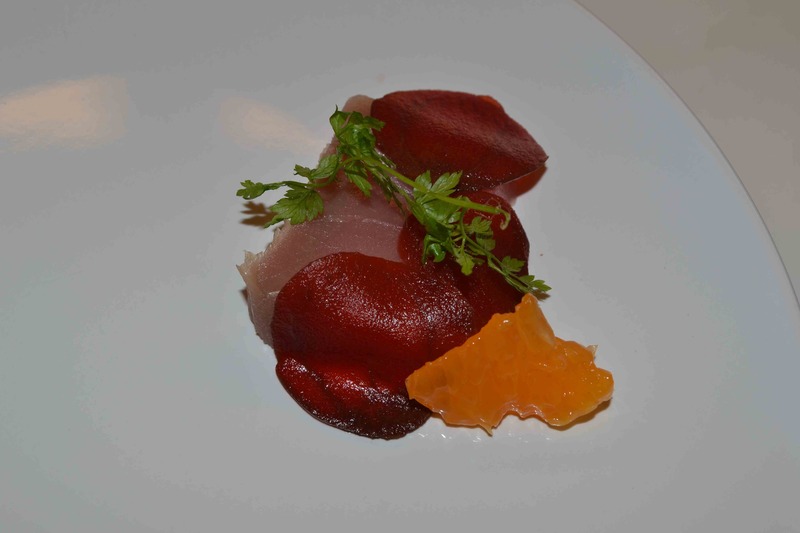 The dish was Bluefin tuna, medium fatty tuna, chutoro, with pickled beet, and mandarin orange. This was one of the first dishes that I felt was a bit too fishy for me, but the dish was once again perfectly balanced with the pickled beets adding tang and earth to the fatty fish while the mandarin orange added a bit of tartness that once again showed off all most of the taste flavors that we are all used to, salty, bitter, sweet, sour. Also, the Asian theme did run through the entire menu and one that was truly highlighted in this delicate but complex dish. To pair with this fatty and complex dish, Jonathan poured a bottle from the Weiss Brothers, and their Shirah winery. 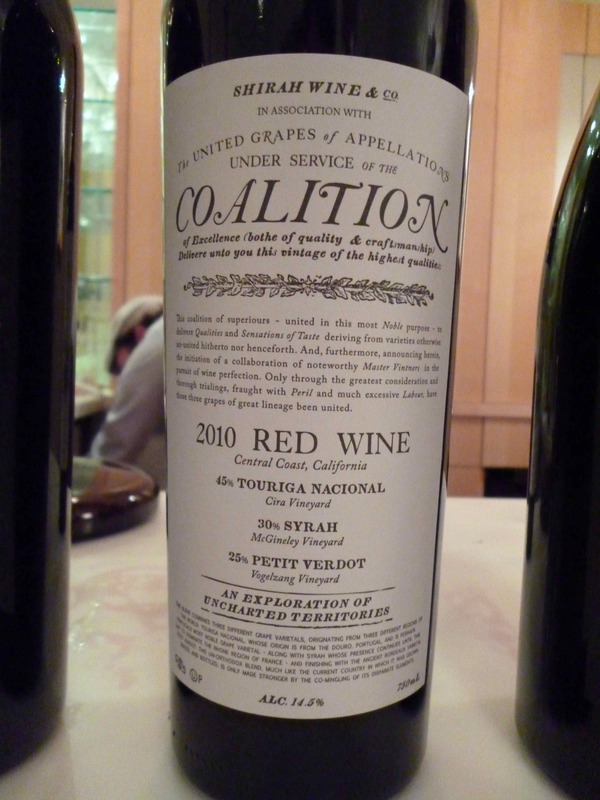 The bottle was the 2010 Coalition, 45% Touriga Nacional, 30% Syrah and 25% Petit Verdot. The blend is clearly unique, with heavy weighted fruit potential, but controlled in a lovely and unique style. I have had this bottle a few times, and each time, I find the wine lovely and unique, but lacking a finish that excites me, which is why it misses on the high end. The nose on this wine is filled with spice, with fun citrus, orange peel, raspberry, crazy rich spice, and lovely leafy tobacco. The mouth on this medium bodied wine is smooth and soft, with a hint of spice, lovely black cherry, currant, nice cedar, and earth. The finish is short and spicy with floral notes, fig, root beer, leather, cloves, cinnamon, and allspice. The only con to this wine – could be the shorter finish than I would want. The spice and earth helps hide the fault, but not one that is totally hidden. For the next course, Bernstein unleashed pure Pisces power with a dish that looked, tasted, and was presented in a way that forced you to take notice. The dish was two courses-in-one, toro two ways, belly toro and head toro, salt, chive, and horseradish served on a black slate, that dares you to ignore it and not scream from the top of your lungs on how perfect the dish tasted. If the blue-fin tuna is one of the more fatty beasts in the water, other than say a whale, than the toro and kama toro are fat on steroids. The toro is the fat from the under and around tuna’s belly, while the kama toro, is even fattier and even harder to find and it comes from the tuna’s collarbone. The dish was lovely, with the two fatty tuna slices looking like marbled meat, much like prime rib or hanger steak. It is crazy what the flesh looks like and even crazier what it tastes like once the fish hits your mouth. It literally melts instantly upon contact, with little chewing or biting required, but still has some give – which makes for a wonderful experience. The toro had a bit of a fishy flavor, while the kama toro had almost no fishy flavor and an even more melt-in-your mouth texture. The cool thing was how the flavor profiles became even more accentuated when you dipped them into the sea salt or the horseradish. 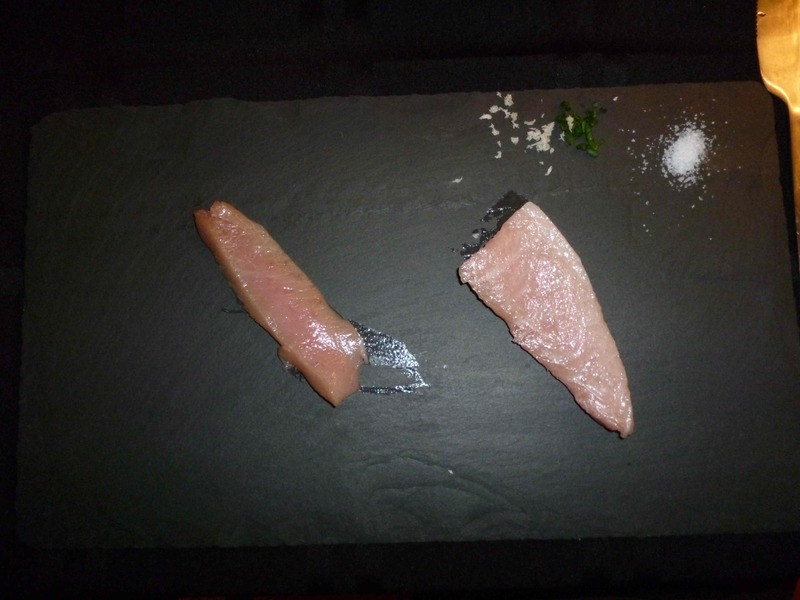 The slate that the two slices of the tuna rested upon was really cool, and added a flair of je nes se pas and also did not impact the flavor negatively in any way, as the slate is a neutral medium. The wine that was paired was once again a lovely medium bodied wine and a wine that Covenant Winery just started to release. This year, Covenant Winery started a wine club called Landsman wine club, which just released the Pinot Noir and will soon release the Syrah and the Zinfandel wines that were quite lovely the last time I tasted them at the winery. It was great tasting the wine again, and seeing it evolve and show its true Pinot Noir characteristics, those being; ethereal flavors, fruit, earth, and a fair amount of oak – believe it or not. It turns out that Pinot Noir is a grape that is finicky to grow, but once it has come to life – is a grape that can handle oak and not shy from it. 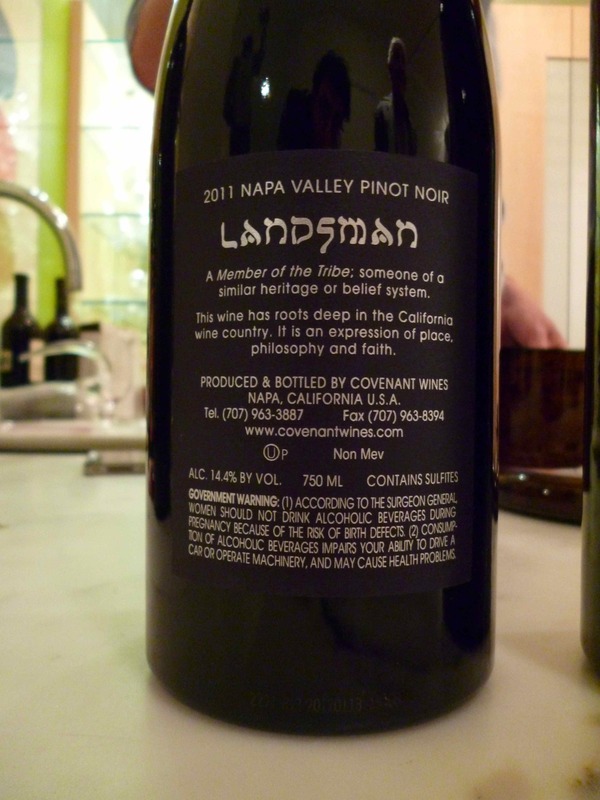 The 2011 Landsman Pinot Noir is not an oak bomb at all, however, it does make its time in the oak felt and helps to round out the mouth on this lovely wine. Covenant is the brand of Napa fruit and big and powerful wines that are rich and bright and layered. It is a brand that is cherished and well worth the investment. However, for the rest of the world, there is Landsman. Brought to you by the very same folks who make Covenant and with a set of varietals that are not so much Napa as much as they are unique and very good. Pinot Noir is one of those varietals that is very hard to find in the kosher variety. There are a few worth of your time and money, this is absolutely one of them. The fruit is bright and rich, while also being full and plush enough to keep you attention. The nose on this ruby colored wine is super rich and crazy expressive with what can only be compared to an espresso machine after a long and hard day’s work, along with rich and bright black cherry, loamy earthy dirt, floral notes, herb, and raspberry. The mouth on this medium bodied is another example of one of those wines that is rich and bright while also being plush and attention getting, with rich and ripe fruit, tannins that are soft yet expressive, and a controlled usage of oak that ties the entire package together. The mouth is coating with nice spices, blackcurrant, and plush mouth coating tannin. The acid and bright fruit are ever so present and the finish is long and with more nice rich brightness, fresh ground black pepper, red fruit, strong mineral leaning, vanilla, and Kirshe cherry that just lingers and lingers. A real and unique treat and well worth your time finding. For the tenth course, Bernstein tapped on the breaks and brought out a course that was more a palate cleanser than a follow-up to the toro powerhouse. 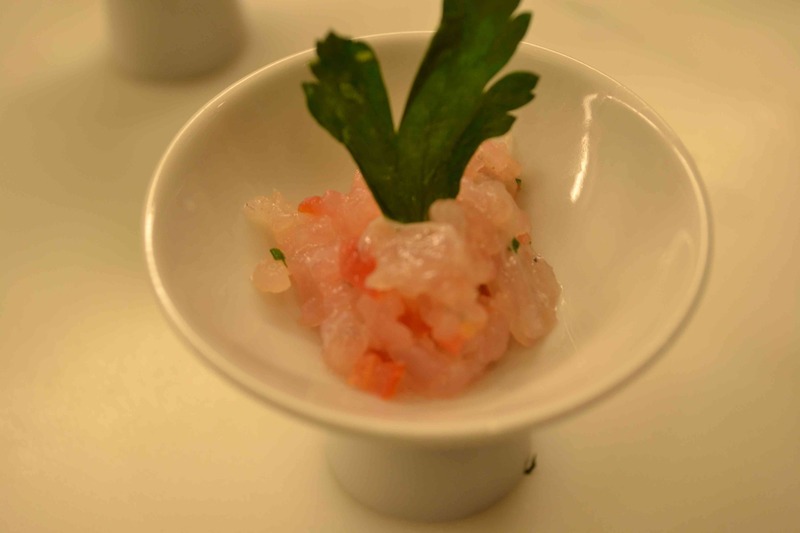 To make this a reality, he brought out a lovely dish of fresh Thai/New Zealand Snapper tartar, with tomato, chives, cappers, lemon juice, and topped with a piece of fried leafy parsley. The entire dish was truly cleansing because it was surprisingly acidic, yet balanced, with a bite that was both meaty, fishy, yet acidic, and salty. Once again, many of taste flavors appeared in the dish along with dollop of umami. It showed lovely balance, and acted as a turn of pace, a digestive aid, and though it was not officially paired with anything, I consumed copious amounts of the lovely 2012 Grenache Blanc. If the meal were play, the snapper would have been best explained as the end of the first act, and now Bernstein’s crazy tour de force meal will take a far more serious turn of pace towards the animal variety. The second act will turn out to be a deft play of hand with Bernstein moving in and around dishes highlighting fowl, plant, and animal, yet never wanting more within a particular dish, or between dishes. Rather, each and every dish, while at times a step back, was a choreographed dance for the next dish’s push up the hill, till we reach the mountain peak and true gastronomic ecstasy. The next dish can be summed up in a single word – hedonistic, and in the most complementary way possible. The dish was veal lardo (from the back fat), cured and than cooked into an emulsified sweet and meaty creation. The lardo was topped with a black truffle mousse, and almost mockingly a slice of thinly shaved radish. 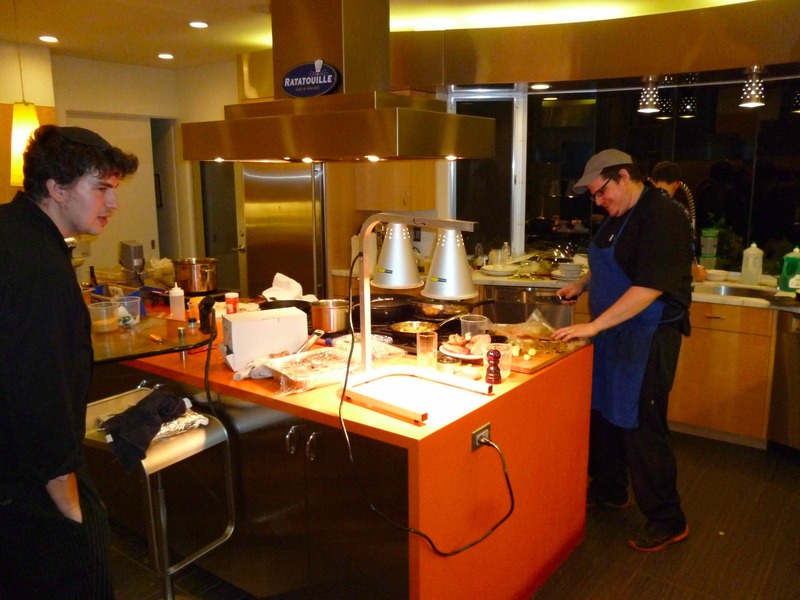 The dish showed Bernstein’s skill in the world of molecular gastronomy, where chef’s embrace sensory and food science, borrowing tools from the science lab and ingredients from the food industry and concocting surprise after surprise for their diners. The dish hinted at what we would see going forward through the rest of the evening. Gone would be the Pisces, and in its place would be fowl, plant, and meat, in shapes, temperatures, and textures that would show Bernstein’s talent. It was lovely because the technique was spot on, mostly because the dish was more about the animal and the dish’s components than it was about the technique – impressive. The lardo touches your tongue and you are in ecstasy, but topped with yet another impressive technique component – the black truffle mousse, makes the dish insane! The hedonistic dish’s double fat delivery system coats the mouth, while the truffle mousse infuses the dish with a nostalgic throwback to the days of the “double feature” presenting the diner with pure joy. It is nothing short of a fat coating experience that is controlled, themed, and showing both sweet, salty, along with a dump truck sized dollop of umami! This was not the first time that I have enjoyed Covenant wines (yeah – yeah coming soon in the article) wrapped within a molecular gastronomy dinner – that occurred with Jeff Morgan (head wine maker at Covenant) and Jonathan two years ago at the now defunct Kitchen Table. To be honest the shaved radish was more a visual component, but it was fun to taste with those two intensely captivating components. Bernstein is known for his lardo and his bacon (no worries – that is coming as well), but now I know why people beat a path to get to this stuff – Truly BRAVO! When the lardo appears – you initially think that this is a powerhouse dish, like pate or bacon. However, once the dish’s controlled flavor hits your palate – you understand how the wine that was poured would be a perfect companion. Jonathan was very kind to share with us a glass of 2003 Capcanes Peraj Habib, one of my favorite wines of old, and one that I had not tasted for sometime. The wine was one of those wines that was better when it was initially opened, according to Jonathan. When he popped it open, it showed blueberry, and other goodies. However, as it opened, it did not improve as much as it did just show its age. Still, a real treat to partake of and my many thanks repeated often to Jonathan for sharing this with us. The nose is lovely, but showed a bit of Brett, along with a bit of volatile acidity, and forest floor. The aromas do not blow away over time, as much as they fade to the background, along with nice coffee, earth, and raspberry. The medium weight mouth is hits you with loamy dirt, blackberry, black cherry, rich and not giving up mouth coating tannin, along with layers of fruit, cedar, all coming together into an exquisite mouth. The finish is long and spicy with flinty notes, along with now fleeting tannin, chocolate, vanilla, spice, cinnamon, cloves, and herb. The mouth is beautiful, if not for the nose, I would have happily scored this higher, but the Brett and VA turned me off a bit. Drink up soon, or you are playing with fire. The next dish continued Bernstein’s climb up to the peak with a thin slice of pure joy. 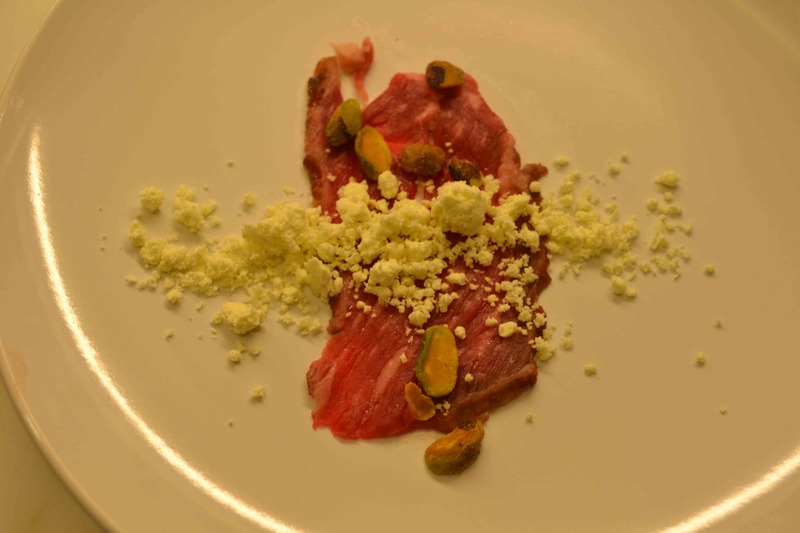 The dish was a thin slice of Wagyu rib eye Carpaccio, lightly seared and then topped with another molecular gastronomic tour de force; olive oil powder, and roasted pistachio nuts. The dish continued Bernstein’s move from the traditional to the future, with his expanding usage of techniques that bend your sense of reality, expand your palate, while all the while keeping the focus on the fresh components instead of the technique. Sure, the dish would be different without it, but the theme never wavers, the ingredients are the prize and not the manner of trickery/cookery. The olive oil powder melts in your mouth and it helps coat the mouth with an oil basting delivery system that is truly unique, and though not all his own, perfectly executed and wonderfully shocking! The dish was a clear showing of Bernstein’s hand, on where he wanted the rest of the evening to go, and also on how well he can play with different ingredients, and continue to deliver a crazy oily, meaty, salty, and umami packed celebrations. Interestingly, while wagyu is one of those meats that instill awe in some of the non-foodies out there, it is quite commonplace for those who truly enjoy bovine – in its fattiest form. Still, since 2007, the wagyu has been disallowed here in the US, as Japan meat/cow is not allowed to enter the hallowed grounds of the USA, because of fear of mad-cow disease. So, most of the meat – sold as wagyu, is really angus meat, served a slightly different diet – FYI for the foodies out there. There was a big hubbub, when it became clear that steak houses and butchers were selling meat for outrageous prices and selling meat that was indeed – NOT Wagyu and NOT Kobe. Wait! What is Kobe and what is Wagyu? I will let Larry Olmsted explain it all, as it is way too crazy complicated for this blog posting. Still, until August of this year (2012), you could NOT buy wagyu meat or kobe meat, what you bought was angus modified meat, which was fine, but did not have the insane inter-muscler fat that real wagyu has. Finally, the USDA allowed wagyu to be shipped into the USA, but only some very small amount. So, when you hear wagyu – what they most probably mean is US modified kobe meat – which is angus meat – with more fat! To pair with this meaty goodness, Jonathan poured a bottle of 2009 Castel Grand Vin. I had the wine at the New York event, of which I have yet to write up, and it was insanely good then and it did not disappoint then or now. While this wine may be a legitimate home run, please do not think less of the other wines that were poured and described so far. Just because their exists an A- to A wine, it does not discount another A- wine, they are both quite incredible. WOW! Let us start with that and go from there – OK, once more – WOW! The wine is a blend of 70% Cabernet Sauvignon, 20% Merlot, and 5% Petite Verdot, aged 20 months in French oak. This is a wine that can use a good decanting and was really aided by Jonathan’s approach with it. The nose explodes with chocolate joy, mocha, rich blackberry, controlled fruit, light herb, graphite, and good mineral. The mouth is full bodied, layered, and concentrated, with a full frontal attack of blackcurrant, black plum, ripe cassis, raspberry, with lots of still not integrated tannin, and rich cedar, which is just beginning to find its stride. The finish is long and spicy with vanilla, bitter herb, citrus zest, tobacco, and hints of sweet fruit on the long finish. In a way, one could look at the previous course as a hairpin turn on the Bernstein all-out downhill slalom of gastronomical delights. It was a slight detour and slowing before the next over the top and almost excessive fat driven delivery mechanism; which turned out to be the Faux Gras, Goose Fat Brioche, and wild huckleberry compote. Now, I can see the foodies out there going, foie gras, so what – and then the would ask (if they are really foodies) – HEY you live in California – that stuff is banned, as of September 2012? Do not get me started! These tree hugging liberals are getting into my pants in ways that make me feel mighty uncomfortable. First they banned cigarette smoking in public places in 1998 (which I thought was great till I realized it emboldened these freaks to control my life), then San Jose enacted the NO Plastic bag law – ARE YOU KIDDING ME, as of January 2012? Anyway, I digress, this is appropriately called faux gras – not foie gras (great pun and turn of phrase Yitzchok)! Actually, this dish is so rich that it was the beginning of the end for some at the table. There were none who wanted to leave at this point, but there were some who started to wonder aloud, is this ever going to end before the we turn into pumpkins? I say this as the dish is so outrageously fatty that the only wines that Jonathan could pair with it were a pair of sweet Gewurztraminer wines from Israel! Humorously, the courses go kept getting more extreme and out there, that when dessert arrived (no worries – that will probably be in a few thousand more words), the only thing that could humanly be paired with it was spirits – I know I tried, sure enough the dessert killed it, but again, I digress – please someone help me!! The dish was truly unctuous and mouth coating to the extent that while the chilled sweet wines paired nicely, they did throw some of the patrons – but hey – who said this was going to be easy! That said, this was the dish that truly encompassed the term of perfect balance in almost every way! 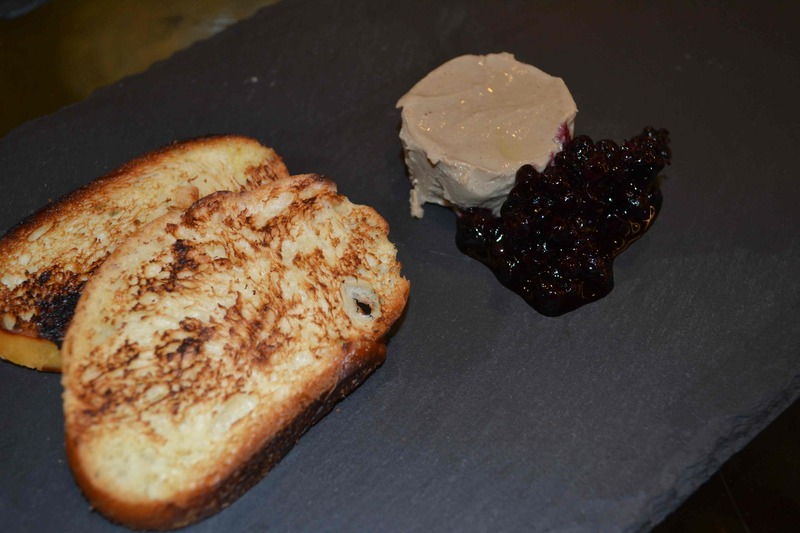 The pate was actually a blend of goose fat, fresh chicken liver, sugar, and salt, paired on the plate with beautiful huckleberry compote, and goose fat induced challah bread! The fat from the fowls used in this dish were filled with umami, salt, slight bitterness, and then perfectly balanced with the sweet (not over or under sweet) huckleberry compote. The two of them in your mouth or on the plate could well have been spoke models for the word “balanced” in any thesaurus out there! Once you add in the goose fat fried challah into the mix, you know have everything that one could call heaven on a brioche! The pate coats your mouth with smooth, layered, fat that hits you first but then gives way to the sweet compote, BRAVO AGAIN!!! This was one of three times that I did not take notes. This being the first time, where I did not take notes for the 2007 Carmel Gewurztraminer, late harvest, Shaal, because I had already tasted it and written about it. 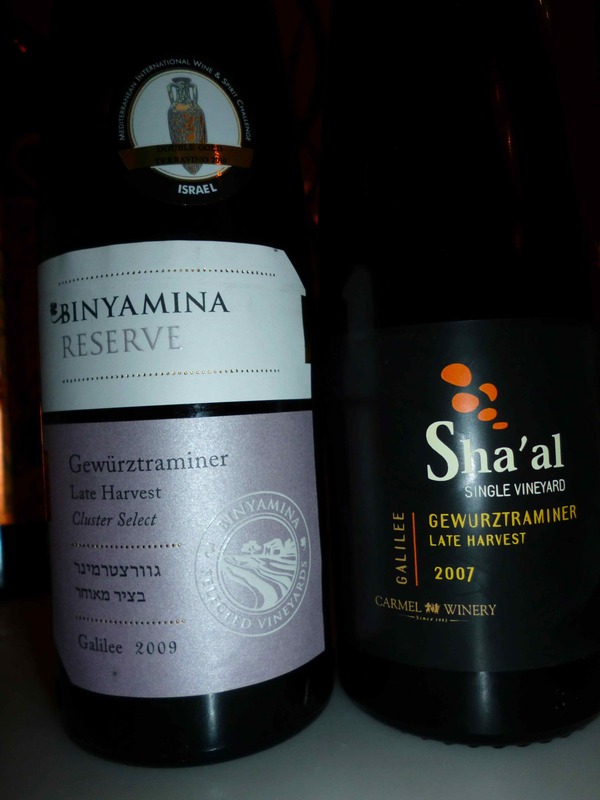 I also did not take notes of the second sweet wine, the 2009 Binyamina Gewurztraminer Late Harvest Reserve, because I was too lazy, and with all that fat in my mouth – I had no chance of giving anyone an honest opinion of the wine. The other time, will be when we discuss the Covenant wines, and why I could not write one then. I know I have used many monikers and comparisons for this event, but at this point it would be the end of the second quarter (though not mathematically), with two dishes that could only be described as “half-time” entertainment, as they are rich but still of the plant variety. Also, I most make note that as of this point, the concern was growing, as wine and courses kept coming and the participants were not quite sure when this thing was coming to an end. I did not take note of the exact time within the dinner, when the participants got up and did stretches, partial yoga stances, and other such things, led by the local area expert – in all such things. Also, this same person was enjoying a different menu through the entire dinner, one devoid of animal parts! I state this only as Bernstein had to keep two entire menus in the air – during the dinner’s flights. Interestingly, many of those “vegan” dishes made their way into the carnivore flights, and for good reason, there were many oohs and ahhs from the yoga leader, and her husband to her left, as she was tucking into her plates of food. 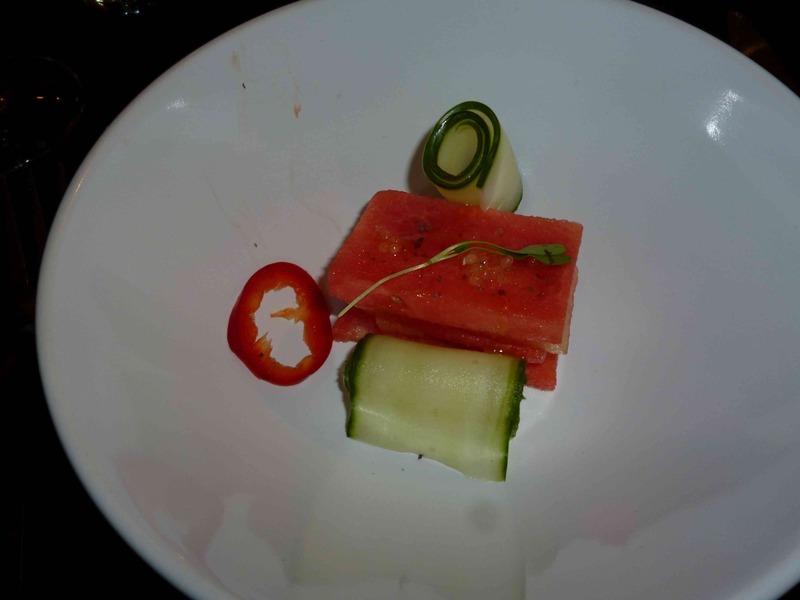 One of the vegan dishes that we enjoyed before this one, was the apple smoked melon dish – using the smoking machine. This flight, and the next one as well, required no such magic or molecular reconstruction, rather it was just solid technique and great ingredients. The dish was Cauliflower Puree, Cauliflower Steak, sour raisin, and ras el hanout spice blend. To start, the Ras el Hanout, is actually an Arabic/Hebrew (rosh de chanut) saying for the “head of the store” – or in other words, best spice in the store. This was a spice saved for special occasions, when money was scarce and happy occasions, even more so. The spice, is a crazy blend of spices, check the Wikipedia link for some of the many options that end up in these blends. 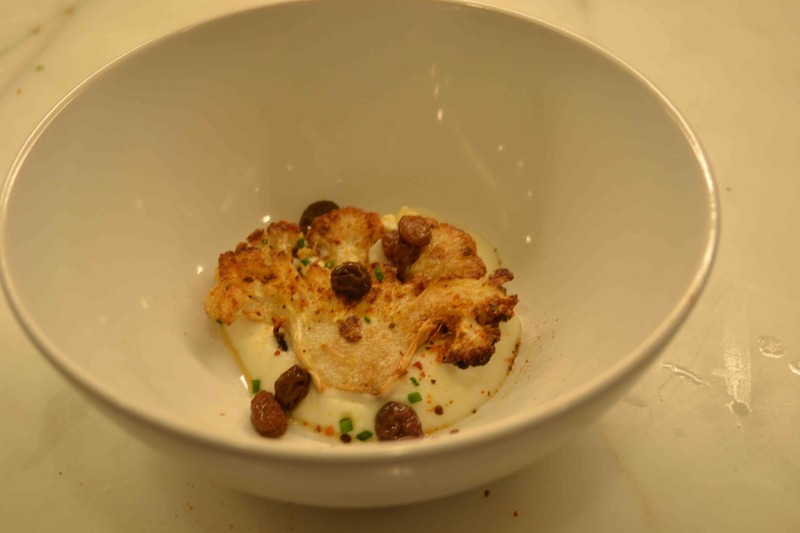 The dish took a thick slice of roasted cauliflower, and placed it on a bed of Cauliflower Puree, sprinkled with sour raisins, and spiced nicely with ras el hanout. Again, this was a classic example of balance, with the sweet puree pairing well with the sweet and spicy spice, along with the sour raisin, and the saltiness from the roasted cauliflower wraps the entire package up quite nicely. There was a slight bit of umami from the spice, but otherwise, this was a four flavor dish. When seeing this dish, I imagine I could hear the sirens going off in Jonathan’s head – YES! I get to use my third edition of my besomim wine! I guess there are two ways one can imagine fighting fire, either with fire or water. Since, wine has a fair amount of liquid and this particular wine has a crazy amount of spice – I can see no better way to fight spice than with spice! I had the opportunity to enjoy a different vintage of this wine last year, when Heshy Fried brought it by the house. The 2009 vintage was equally as impressive, though slightly less aggressive on the spice, though still massive in its own right, and one that I did not have the opportunity to try. The wines truly live up to their name. Besomim is Hebrew for a potent spice mix that is used as part of a post Sabbath havdalah (or separation) ceremony. The grapes for the first two vintages come from a field blend of Zinfandel, Grenache, Syrah and Petite Sirah. A field blend is an actual vineyard that has a disparate set of vines comprised from these four varietals. They do not all ripen at the same time, but since they are haphazardly spread around the vineyard, you have no choice but to harvest them when it best for the group, making for a unique blend. The blend is fermented together and aged together and then bottled as one. The 2010 blend, which what we enjoyed at the dinner, is a blend of Syrah, Grenache, and Petite Sirah, all picked from Eaglepoint Ranch in Mendocino County. The nose explodes with jammy fruit, raspberry, currant, good loamy earth, and of course, insane spice! The mouth on this medium bodied wine is heavy, rich, and unctuous. It all starts with the same old story, heavy spice, followed by fig compote, black plum, lovely mouth coating tannin, and herb. The finish is, you guessed it, long and spicy, with crazy vanilla, tobacco, and dried cherry. For the second part of the halftime festivities, Bernstein shared a lovely and rich plant-based dish with us all; Gnocchi, Roasted Wild Mushroom, trumpet mushroom, portobello mushroom, Parsnip puree, fennel frond, and rosemary oil. This dish is a perfect example of how a purely plant based dish can be rich, attention grabbing, and all without any cheese or meat! Of course, it helps that mushrooms are umami powerhouses, and have that wonderful meaty qualities, even before they are roasted. Add to that rich and soft Gnocchi, cooked perfectly with a texture that returns your bite with just enough firm structure. 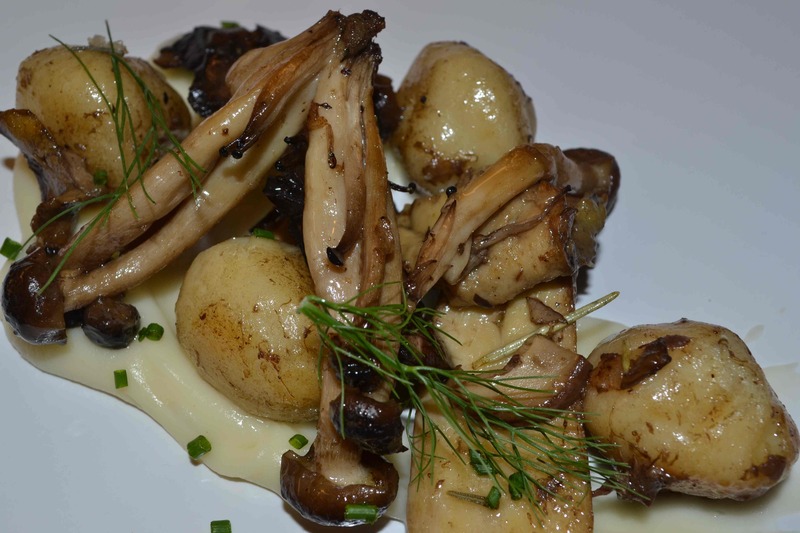 The roasted parsnip puree, was sweet and lovely, while the mushrooms were channeling salty and umami goodness. Bitter and sour were blissfully absent, and replaced with a caravan of umami. The rosemary and rosemary oil did add a snippet of bitterness, but mostly they added earthy and woody goodness. The flavors in the mouth caused me to have a sensory overload, which blew me away again because Bernstein could have applied the common disclaimer – “no animals were harmed in the production of this dish”! The texture and flavor of the roasted mushrooms – all three of them, along with the sweet parsnip puree created a perfect place for the rosemary to be added to make the dish wish to exclaim – “you complete me”! To pair with this textural and sensory powerhouse, Jonathan chose a perfect companion, the 2011 Landsman Syrah. When one looks up the classic Syrah grape, from the Rhone Valley, it is commonly blended with other varietals, and one of the very cool characteristics is blueberry, though it is hard to find in a kosher version. Most of the rich or subdued versions of kosher Syrah are richer in tar, heavy black fruit, and black pepper. This bottle shows the rich black fruit, and distinctive espresso flavors, but it shows the rich blueberry aroma and flavors, something I cannot help but smile when I smell and taste it. The nose on this dark purple and brooding colored wine starts off with a BAM of blueberry liquor, something that is impossible to miss, followed by boysenberry, rich blackberry, raspberry, and spice. The mouth on this rich and full bodied wine starts off with an attack of rich massive tannin, rich and velvety, with concentrated, sweet, and focused blue and black fruit that mimics the nose along with root beer, and enough oak to round the fruit, with all the components coming together nicely. The finish is super long and rich, that has an air of completeness while still being firm and concentrated, laced and ribboned with roasted meat, rich espresso, chocolate, and vanilla. As time progresses look for leather to appear on the long and spicy finish. 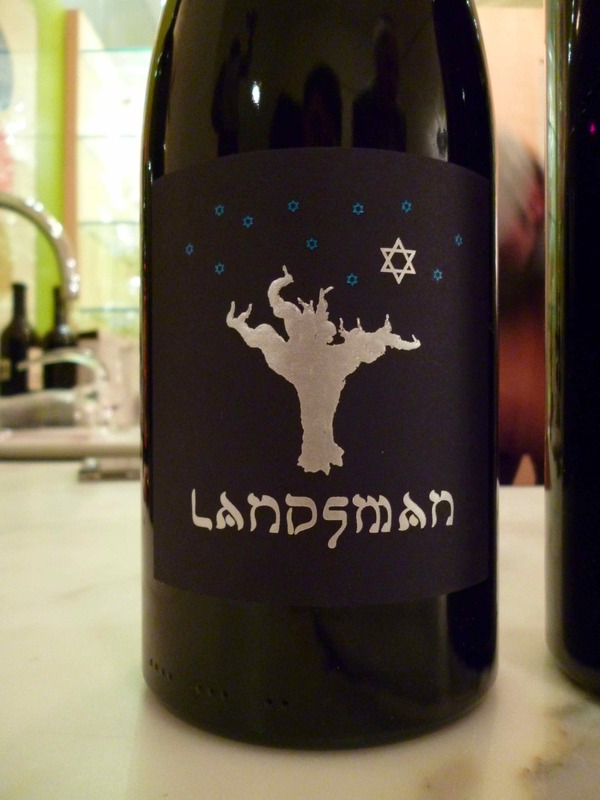 BRAVO to Landsman and well worthy of the title – best kosher Syrah from Napa Valley (in my humble opinion). At this point the halftime festivities were over and the next course started the final culinary assault to the peak of the mountain. The dish was pulled Goose confit, Braised Fennel, artichoke, chives, and Garlic Crumbs. Though there was no molecular modification here, once again the dish was beautiful to take in and beautiful to taste. The pulled goose confit was soft while having lovely texture, pilled atop the braised fennel and artichoke. The artichoke was also soft and buttery, while the braised fennel was a textural delight. Put together, the entire dish came around quite well, and was topped with garlic crumbs and chives. This was another dish that was perfectly balanced with oily, salty, and slightly bitter, with lovely sweetness from the goose, and no sour to be found. The dish comes across as layered, intense, and rich with goose goodness. I must say, that while duck is lovely, goose is more fatty and richer, sweeter with a bit of earthiness. To pair with this dish, Jonathan shared with us one of the real winners in the Israel Wine world – the 2006 Yatir Forest! The forest was black and ripe with good herb-iness, matching well the fennel herb-iness and the gooses’ fat. It was a lovely pairing and a wine. A Bordeaux blend of Cabernet Sauvignon, Petit Verdot and Merlot (50%, 38% and 12% respectively), oak-aged for 16 months in French oak. The nose on this wine is rich with blackberry, heavy herb, bramble, forest floor, raspberry, and spicy fruit. 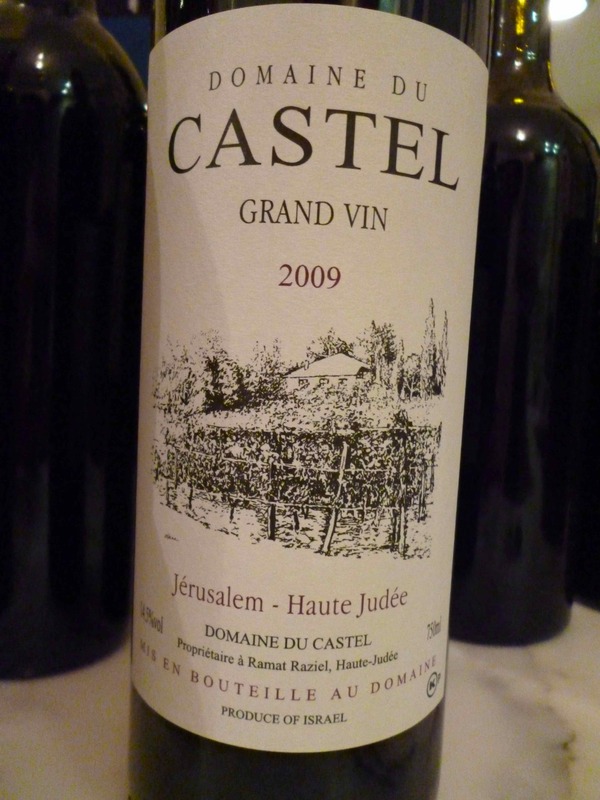 The mouth on this ripe and full bodied wine is rich and layered, with concentrated fruit, cassis, plum, that has none of that overly ripe Israeli raisin or date fruit, along with mouth coating tannin, and great cedar that brings the entire package together so well. The finish is long and rich with heavy spice, herb, mounds of leafy tobacco, eucalyptus, chocolate and dark fruit. This is one heck of a wine and a true joy to behold. The wine tastes lovely now, but can easily go on for another 4 to 5 years. The next dish was a great blend of sweet, salty, bitter, and sour as well, it was seared duck, with preserved strawberry, strawberry jam, and Balsamic reduction. This is a classic dish, with sweet and sour fruit (from the preserve) used to balance out the meaty flavors of the duck, and the balsamic reduction helping to add more weight to the dish. The duck was seared quite well and tasted like a slab of meat, and with the courses now clearly veering away from the lighter and more Pisces and plant based dishes, the participants were now clearly understanding that this was going to be a climb and that they either were going to get behind it or they were going to be left behind. gastronomic Olympics, I could fully understand why some were wondering – is this the final dish? I remember being asked that during the course of the dinner, and I was keeping track of the wines, with no real idea of what dishes were coming. I knew which wines were coming so, I could help folks come to grips with what still lay ahead. To me, this was – are you kidding me! Please bring it on – this is awesome, this is a once-in-a lifetime experience, and I did not want to miss any of it. The dish was clear decadence with layers of red strawberry fruit, along with lovely duck earthiness, that blended together perfectly with the vinegar reduction and paired well with the earthy and herb packed French wine. Jonathan came around and shared with us some wonderful French wine that I had tasted before at a few wine events and one that is well beyond my price range, but one that is always a joy to taste; that being the 2005 Chateau Leoville Poyferre. The wine is a classic Bordeaux blend that is mostly Cabernet Sauvignon, and though Bordeaux does not get that warm the fruit is ripe and black, but still shows that famous earthy, herb based, French terroir. Though I had tasted this wine in the past, I had never yet tasted this 2005 vintage. The wine paired so well with the duck and was a forbearing of the bigger red wines that was coming our way. The nose was super ripe and black with blackberry, bramble, tons of dirt, loamy earth, mineral, and eucalyptus. The mouth is rich, ripe, and layered with nice soft concentrated fruit, lovely mouth coating tannin, tobacco, and oak. 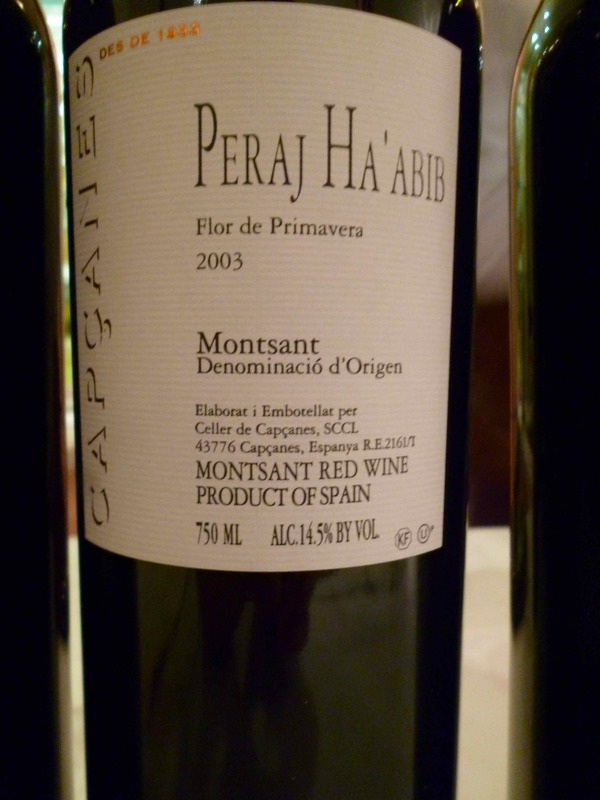 The mouth is rich and velvety and one that makes you take notice with all of its concentrated fruit. The finish is long and earthy, with chocolate, vanilla, heavy tobacco, raspberry, green notes, and more mineral. Quite a lovely wine – but one that still misses the next level solely because it lacks a bit of balance with all the green and earthy notes taking over the palate at times. The next dish was one of my favorite for one very simple reason – fritter! Yep, I may be a want-to-be foodie and a solid oenophile, but I still love my fritters! The dish was duck confit, yam fritter, marshmallow fluff, maple gastrique, anise, and cinnamon. All I can say, is lovely – this dish once again shows that duck can handle just about anything you want to throw at it! Marshmallow fluff! Are you kidding me! Let me give you another word for that stuff – sweet, sugar laden, machination. Well, this fluff, was lighter than that stuff you buy in the jar, but it was still quite sweet! The yam fritter was sooooo crispy and did I say it was YAM! OH! Did I say it was a fritter, a crispy fritter? AWESOME! Without doubt – this dish was one of my favorites and that was because it had a yam fritter in it, yeah I have repeated this a few times – get over it! The pulled duck confit covered the fritter, though it does not show well in the photo, short of a few pieces of meat peaking out from under the massive dollop of marshmallow fluff. Topping the fluff was some maple, cinnamon, and anise gastrique. Of course the dish was a clear ode to the Turkey day that was later that same week, and this dish was so rich, fluffy, and crunchy that it was a true perfection. One word sets the entire picture for you – AWESOME! The fritter was crispy, while the duck was soft and rich, and the creamy fluff put all together perfectly complemented each other, and it was truly a joy and honor to experience this dish. To pair with this wonderful dish was an astonishing wine that could handle all the sweetness and fat, and cruise through it all like a hot knife through butter (no butter was used in the meal – just using it for an analogy). Jonathan was kind to share with us a wine that is from Covenant, but not one that he helped on; the 2005 Covenant Cabernet Sauvignon. The wine tasted like fruit jam, eucalyptus, rich black cherry, other black fruit, and herb/mint. The ripe fruit, herb, menthol, and extraction, help the wine to match up mano-a-mano with the marshmallow sugar and duck sweetness and crispy yam fritter! What a joy. Thanks to Jonathan for sharing this joy with us all. The nose explodes with crazy ripe fruit, fruit jam, eucalyptus, raspberry, blackberry, and plum. The mouth on this full bodied wine starts off with crazy menthol, ribbons of eucalyptus, mint, baskets of cranberry, blackcurrant, black cherry, cedar, and lovely integrated tannin that is lovely. The finish is long and spicy, with chocolate, leather, leafy tobacco, vanilla, and fruit with more eucalyptus lingering long. The next course once again showed off crazy technique on the final fowl course; Slow cooked goose breast, maple poached pear, celery root puree, pears, and chestnuts. The slab of slow cooked goose used one of the technology grand daddy’s in the world of molecular gastronomy, and now becoming somewhat ala vogue – a sous vide machine. The sous vide technique allows the chef to make sure the meat or plant or Pisces is cooked to perfection end-to-end, and can NEVER be overcooked. The con is that the food comes out looking like it was boiled, no crust, and no Maillard reaction at all. To remedy that the food must be quickly browned after coming out of the sous vide machine, which is a bit more work, but the outcome is heaven! The meat is soft and tender, while showing a lovely crust and meatiness. Once again all the food groups were on display for this dish, the sweet pears, the salty and slightly sour celery root puree, and the bitter chestnuts – made for a complete flavor profile dish. Of course all the flavors were in perfect harmony, with the goose showing rich earthy and meaty qualities, the sweet maple pears, and the puree – was a home run in the mouth. The textures and the balance was pure hedonism meshed with gastronomic joy! To pair with this magnificent dish, Jonathan shared with is one of the lovely wines out there; the 2003 Pontet Canet! This was the third or fourth time that we have tasted this wine, and each time I am blown away. The wine is rich, layered, and textured with lovely eucalyptus driven concentration, black fruit, earth, and yeah hints of Brett, I guess it is the life with French wine. This wine is still kicking hard and not one that is going anywhere any time soon! Thanks Jonathan for sharing this lovely wine with us. Mind you, that is statement I have made many times, and will be saying even more in the future courses. These wines are getting so absurd, that as folks were slowing down and falling out, they were slugging down the previous glass to make room for the next, and it killed me. These wines were so absurd, that it was inevitable that the wines started to blend into each other, not withstanding their awesomeness! 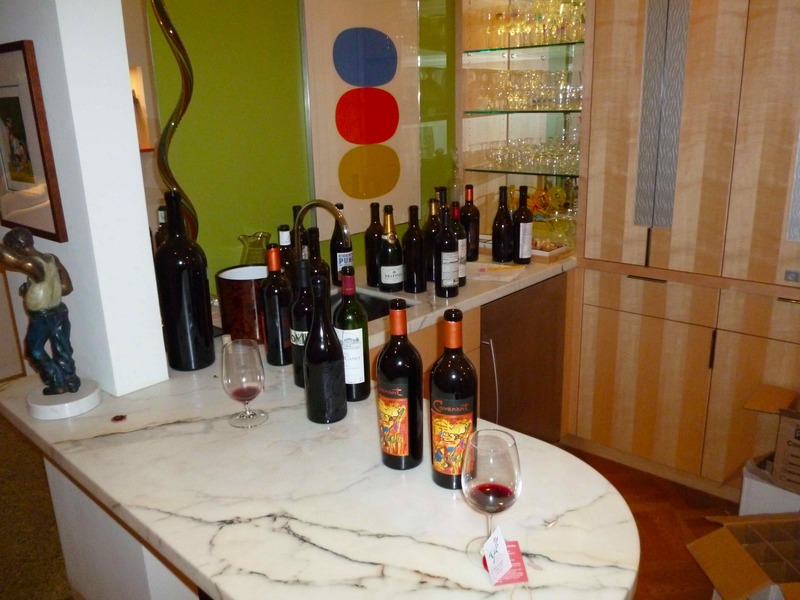 Folks were appreciating the wine for sure – but folks were also becoming desensitized to the greatness of these wines and it was a shame, but still a wonderful and great opportunity to taste all these wines! The color on this Bordeaux is deep garnet to black. The nose on this massive Bordeaux is chock full of graphite, cassis, blackberry, black cherry, Brett, earth, and mineral. 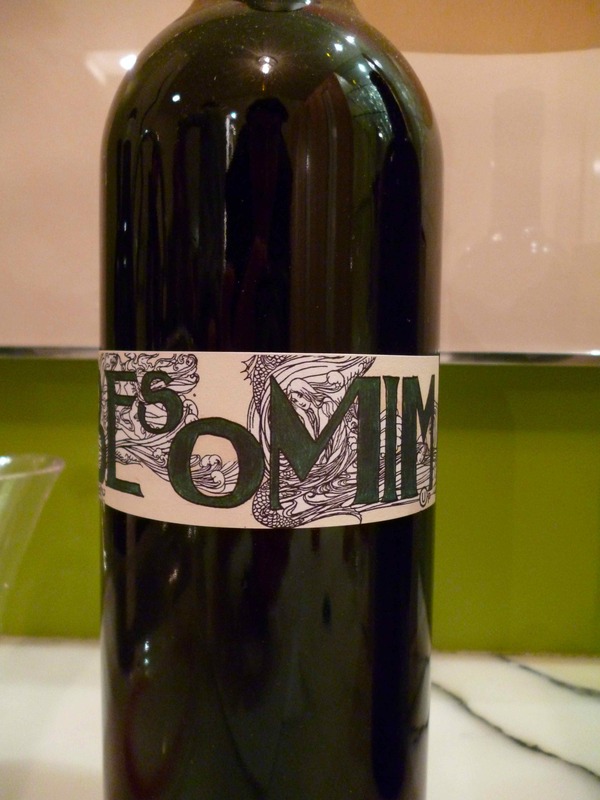 This is a massive wine with complex layers of black fruit, spice, and green herbs. The mouth is still rich in tannin and like last year, it is still massive but the chocolate has moved to the back and the oak and tannin have moved into the forefront. The mouth is rich, layered, concentrated and heavily extracted with lovely layers of black and red fruit, along with currant, oak, and still kicking but integrating tannin, that has finally come together into a crazy fun and unctuous mouth. The finish is expressively long and rich with tobacco leaf, chocolate, eucalyptus, menthol, and lovely forest berries that last long. This may have been the best bottle in the evening along with the crazy Solomon that was to come along later, and do not forget the lovely Landsman Syrah. 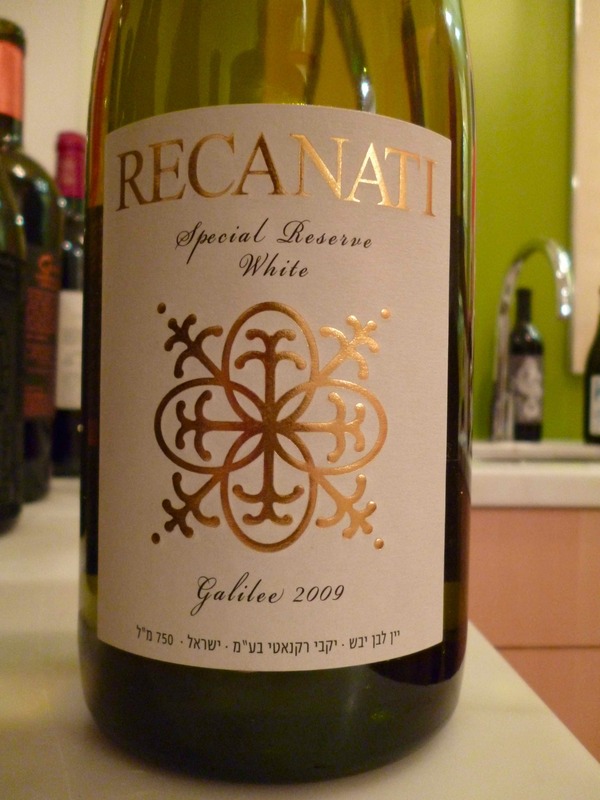 This is such a lovely wine because it does not have over the top sweet notes that many Israeli wines are riddled with, it also has a controlled use of oak, and yet it has lovely ripe black fruit, and earthy notes – Bravo! At this point the captain shifted the dinner’s course of direction back into the bovine land, both young and older bovine land. The first meat dish (other than the lardo and Carpaccio) was Cider brined Veal Loin and eye, apples, butternut puree, miso butterscotch puree, butterscotch chunks. The original dish did not call for the veal eye – but I am not complaining! The meat was out of this world, the loin was a bit mellow, on purpose to pair with the miso butternut squash puree, where the puree became the focus and the texture focus was the loin. The loin was firm to the bite and paired with the miso butternut – it was exquisite. The eye was super soft and it paired with the butternut squash puree that it sat upon, but here the star was the meat in both flavor and texture. The butternut chunks worked with both cuts of meat and the apple brine and apple chunks added both sweetness, sourness, along with more salt and bitterness than you could shake a stick at, and of course TONS of umami! In other words all five flavors on a single slate – and mounds of meat to go along with all of that – are you kidding me! It was fantastic, the technique here was perfect, and though the salt level was high for me, it was perfectly within your control, by eating less or more of the miso butternut squash puree. To pair with this slate of meat, Jonathan poured another Covenant wine – one that I think he helped on when he was working for Herzog in 2003 (where the wine was made for three years); the 2003 Covenant Cabernet Sauvignon. We have had the privilege to taste this wine a few times now – and each time it is a true joy. The last time I had it, I had a so-so bottle as the cork went bad on me, but this wine was as I remembered it – black, rich, and opulent – what a joy to enjoy! Are you kidding me! This wine is as close to “filthy” as it gets without being covered in dirt and muck! This puppy is downright crazy, lovely, and insane! This wine was awesome, black, earthy, and lovely! The nose on this dark garnet to black colored wine is packed with rich ripe blackberry, plum, crushed herbs, earth, raspberry, black cherry, and eucalyptus. The mouth on this blockbuster full bodied wine is concentrated, layered and mouth coating with lovely and almost integrated tannins, I was shocked by how much tannin was still present – after being decanted twice. The mouth showed lovely black fruit, currant, sweet cedar, sweet fruit, the integrated tannin creates a mouth coating reality – that is quite lovely. The finish is long, spicy, with sweet cedar in the fire box, a long puff from a fat stogie, a warm cup of mocha in your hand, while munching on blackberry, black currant, and vanilla. With the boat clearly pointing towards all things bovine, the chef served another dish of veau, the veal was braised in cider, but this time it was paired with a different set of sides and the cut was also different. The dish was cider braised Veal breast, Red Wine Cabbage, root vegetables, and Charred Brussels Sprouts. The meat was really soft and was clearly cooked with a sous vide machine, but I did not get the animal cut – sorry. The cider braise did not make the meat taste sour or bitter, the cider braise helped the meat to be really soft and yet firm to the fork. The pairing with the red wine cabbage was lovely, a blend of sour and meat. The charred cabbage adds a bit of bitterness along with nice meaty and earthy flavors. All in all the dish was once again balanced – but the fat from the veal and the vegetables make for a killer pairing! Jonathan once again paired the dish with another killer wine; the 2009 Shirah Power to the people. A wine we have enjoyed a few times now and a wine that I love each and every time I drink it. Once again the wine showed beautiful ripe fruit and spice that melts the brain! The wine is made by the Weiss Brothers, who own Shirah Winery, who specialize in Rhone varietals, and small batch and artisan based wines. I am always in awe at both Jonathan’s wines and the Weiss brothers wines – they both create wines that express sweet fruit, heavy extraction, and yet balanced wines, that do not taste like raisin or dates (an issue that Israeli wines have), but do show sweet ripe fruit. Because the wine was opened in advance – we lost the lovely peach, violet, and floral notes that come from the 2% blend of Viognier – if you wish to enjoy those notes – smell and taste the wine after opening and then wait for the wine to fully open later – a win-win approach. The wines from Shirah and the Weiss brothers never cease to amaze me with their sweet and ripe fruit that is also NOT overripe, hot, or overly new-world in style. The nose on this purple colored wine starts with redolent notes of blueberry, boysenberry, blackberry, sweet raspberry, and spice. The mouth on this is rich, layered, and inky with pure and focused fruit, black cherry, blue and black fruit, cedar backing, and lovely spice that highlights the wine and comes together with mouth coating integrated tannins. The finish is long and spicy with animal notes, graphite, tobacco, and leather all coming together with blueberry, watermelon, cloves and cinnamon lingering nicely. This next dish overall, moved away from the bovine, by blending cow cheek, lamb shoulder, and ox tail. That said, the mannerism in which it was built was explained to me twice and in the end, I could not get it. The dish tasted GREAT, intense and insane, but the dish used crazy amounts of molecular gastronomy, by roughly pressing the beef cheek, ox tail, and lamb (all very fatty meats) and over night the meat turned gelatinous. Than Bernstein took the animal based gelatin, coated it with panko, and than fried it! It may not sound great – but WOW did it taste lovely! The dish; Pastured Lamb Shoulder, ox tail, and beef cheek, Eggplant, curried Carrot Puree. The dish could be quickly classified as lamb ecstasy. The lamb does not hide behind the gelatin-ized meat! Rather it comes out and melds perfectly together with the gelatin base, while the sweet carrot puree adds depth and sweetness to the lamb’s earthy and gamey flavors. BRAVO!!! This was paired with a wine of which we cannot talk – because it has not yet been released, and even if we could talk about it, I could not because I did not write the notes – sorry. This next dish was pure bovine and maybe it could have been renamed – pure heaven! I forgot to mention that a dish or two before this one, there was as close to a mutiny as one can have at a multi-course dinner. To be fair, as explained before – the time was way out of what folks were expecting and they had to get to work the next day, or in this case – today! Yep, the clock had turned over and many were worried they would turn into a not-so-great fairy-tale ending! I guess it was their loss, as the last two dishes – were the best of an already VERY LONG list of great dishes, and that is a real shame, but life does take precedent. The next and final meat dish of the evening was three dishes in one, as even the strong among us was starting to wonder! It was; Short rib, turnip, charred broccolini, spring onion, and soy glaze. Crescent butchers cut. Wagyu ribeye, goose fat potato puree, and chanterelle mushrooms. I think one of the survivors of the event said it best, this is a dish that alone – could be an entree at most restaurants. That statement alone really sums up the evening – a truly hedonistic and joyous event, and one that takes a REALLY long time to type up! I cannot imagine many will read to the end, but please think about the effort it took to plan, make, and serve this event – WOW! Indeed if the evening was over the top, than this dish – pushed it into the next galaxy. The dish was rich and insanely meaty, with rich marbled cuts of meat, that was a real treat to enjoy. The first “dish” was Short rib, turnip, charred broccolini, spring onion, and soy glaze. The meat on this cut was lovely, super fatty, and rich, fall-apart texture, while all the while being firm enough to feel like it was a different cut of rib – impressive. The glaze added a bit of weight to the dish, but the ode to something resembling a vegetable – was what made me chuckle quietly. The overall dish was obviously meat dominated, but the charred broccolini and turnip, added a bit of bitterness, and the soy glaze and spring onion added sweetness that really brought the dish around. Humorously, I am sure Bernstein could have pulled that off without a vegetable, but his desire to use some, was what made me chuckle. On an aside, the rib was slow cooked in the sous vide – for 72 hours to a temperature of 144 degrees! The crescent butcher’s cut, also called the rib-eye cap, is the tastiest and tenderest portion of the rib-eye, this is the well-marbled, crescent-shaped outer rim of the rib eye. It’s a rib-eye lover’s favorite part of the steak. Given its name for its clear and obviously crescent shape. There’s the bone, then there’s the large eye of meat attached to it, and then around that eye of meat is the spinalis dorsi, the rib eye cap. If you trim it off from the ribs before cutting them into steaks, you end up with an entire muscle about 16 inches long, 8 inches wide, and an inch thick. This is the gold you are looking for. To say the cap was hedonistic would be underselling it. Look at all of that marbled meat! Fatty, rich, and perfectly cooked, medium rare – with rich and layered flavors – wow! The third dish on the slate, was the Wagyu ribeye, goose fat potato puree, and chanterelle mushrooms. Here the hedonism continued with such a rich puree that it was criminal! Who ever knew that goose fat and potatoes meshed together – so unbelievably perfectly! Goose and beef – what a great pairing. Fat and more fat, followed by starch and some earthy mushrooms to go with it. Pure adrenaline pumping umami, wrapped in a hedonistic basket of goose fat, meat, and a tiniest sense of vegetation! The wagyu rib eye was on par – in marble content with the other cuts, but was taken to an entirely different level with the goose fat based potato puree – BRAVO AGAIN! Well at this point, I was shockingly fine – from a wine and mental capacity level. Why? Because by the 10th course I was spitting, another aspect – which the participants were very cool about, and maybe part of the reason why some bowed out a bit earlier. Indeed – 20 rounds of any wine – will and should do in folks – no matter the number of yoga poses or stretches are accomplished! Well Jonathan was absolutely 100% unfazed by the dropouts and kept pushing on with his apparent desire to pour wine whose value exceeds the US government’s total gold holdings in a single evening! Are you kidding me! I was tempted, but I am not so uncouth to actually count the value of the wines poured – far be it from me, but please do not even begin take the lack of a final number as me under-appreciating the kindness of Jonathan and his cohort in crime! The meal, wines, company, and overall camaraderie, were a unique and one-in-a-lifetime event. Jonathan started with an insanely fantastic wine; the 2009 Covenant Solomon, lot 70, Cabernet Sauvignon and than followed it up with his awesome 2010 Brobdingnagian Grenache. According to the way that Jeff Morgan explains it, when he wanted to start his winery, his good friend, Leslie Rudd (a man), owner of the famous Napa Rudd Winery, asked him why kosher wine tasted so bad. Jeff replied that were many great wines, and on a dare Leslie said, why do you not make some kosher wine, if it is so easy to do? Morgan, says he replied sure, but can I use your grapes? According to Morgan Leslie replied, no way, you will mess them up and than I will look bad! So Morgan was on his own and what a story that has been. We tasted his first and third release – the 2003 and 2005 Covenant Cabernet Sauvignon and now we were being given the chance to taste the coveted and very rare and expensive Solomon Cabernet Sauvignon. The name comes from the fact that Morgan never let Leslie forget their initial conversation, and once the winery was proving itself to be world-class in its execution and that kosher does not define wine – but rather elevates it, he was ready to ask Leslie to make the ultimate sacrifice. Leslie obliged and in 2008 released the first vintage of Solomon Cabernet Sauvignon. Why Solomon, because Leslie’s Hebrew name is Solomon of course, and why lot 70? Because that was the hopper number they were given at their crush site and it just happens to turn out that yayin, wine in Hebrew, has a numerical value of 70. So, Covenant Cabernet Sauvignon, Solomon, Lot 70 it is! The 2009 Solomon is the second vintage and WOW what a wine it is, black, opulent, layered, but with so much more to share as you sip and savor it – Bravo Jeff Morgan! The wine is in its second vintage, using grapes from the coveted and award wining vineyards that are owned by Rudd Estate Winery. The wine is limited and hard to find, but it is well worth the effort even if it is quite expensive. The wine is one of the purest expressions of Cabernet Sauvignon that I have had the pleasure to enjoy. It is truly one of those “save it for a special occasion” wines. The nose starts with ripe black cherry, herb, eucalyptus, graphite, mineral, and intensely ripe blackberry. The mouth makes you ant to get up and scream – BRAVO! It explodes with layers of finesse, no sledgehammer can be found here, rather just soft and intense layers of concentrated fruit, lush and beautiful mouth that expresses black fruit, plum, cassis, all pitched under a tent of cedar and mouth coating tannin that never seems to end. The finish is long and rich with mocha chocolate, leafy tobacco, truffles, and intense extraction that seems to linger so long that you wonder if there is still wine somewhere in your mouth. The wine is so smooth yet complex and yet still rich that it really does give you a glimpse at what top-notch kosher wine can taste like. Bravo Jeff you proved to your friend that kosher is not the limitation of kosher wine, but rather it’s in the hand of its muse and creator! This wine can be enjoyed now, but give it 5 years and than it will really be able to strut its stuff! The other wine was the 2009 Brobdingnagian Grenache, a wine that I have had the chance a few times now in barrel, bottle, and now at this event – and it continues to blow me away – proving that the Rhone Rangers really knew what they were talking! The last time we tasted this wine, at the other regal kosher affair I enjoyed with the Sharpshooter, the Writer, the Winemaker, and the drinker. There the Grenache showed off Chicken Cherry Cola, which I use primarily to describe Four Gates Pinot Noir, but it did show up in the Grenache as well. Well, this time the wine seems to have moved off the cherry cola for now and on to other wonderful aromas and tastes. The main shocker was the orange rind – I was not expecting that one. The orange notes were lovely and rich and did not transfer to the mouth – but still quite unique. The nose on this rich and perfumed wine starts with lovely aromatics, floral notes, orange rind, cloves, heavy spice, cherry, and licorice. The mouth on this medium bodied wine lives up to Brobdingnagian name with crazy searing tannin, nice green notes, rich extraction, layers of concentrated red, black, and blue fruit, ribbons of blueberry, mouth coating tannin, and wood all melding together quite nicely. The finish is long and spicy with more bakers spices, dark kirche cherry, nice espresso, dark chocolate, vanilla, herb, mineral, and spice. Grenache may be called the Rhone’s Pinot Noir, but there is nothing ethereal about this wine – it is a massive Brob wine that happens to be a Grenache! Give this time and it will show more of its black fruit that is hiding behind the spice and wood. As promised, twenty seven courses. Really, there were another two or more that we enjoyed in parts and worthy of being here as well, but I did not feel comfortable talking about something that was not presented, in its intended form, by its creator. However, the last course is no let down in any way! The way I described this one to the few stragglers left, was “the metropolitan hedonist meets city slicker”. The actual dish is called; Veal Bacon, Goose fat Challah French Toast, Peanut Butter Mousse, and maplewood syrup. This was the culminating dish, and though it contained no chunk of animal – it was by far the most hedonistic dish of the night and one of my strong favorites, which is difficult to define given all the fantastic options. The funny thing was that I tried to pair it with some of the sweet wines that were paired with the faux-gras and – not a chance. The sweet wine never stood a chance – it was steamrolled and than packed over again – to make it clear. Bernstein knew this and wanted to pair it with bourbon, but believe or not – that was my limit, I was not going to down liquor at 12:30 AM. In the end, the dish was sick, the creme peanut butter, another molecular distortion creation, was rich, layered, and smooth, and melded perfectly with the goose fat challah, and the lovely veal bacon. The sweet peanut butter tempers the goose fat and the bacon and makes for a fantastic dessert – that I will not so soon forget! I close with the words – thank you! Thanks to the hosts who stayed up with us and enjoyed the entire party, thanks to the captain and to the associate steward and head sommelier – for their endless and tireless work, to make us feel like we were royalty. Finally, if you really did read this far – thanks! 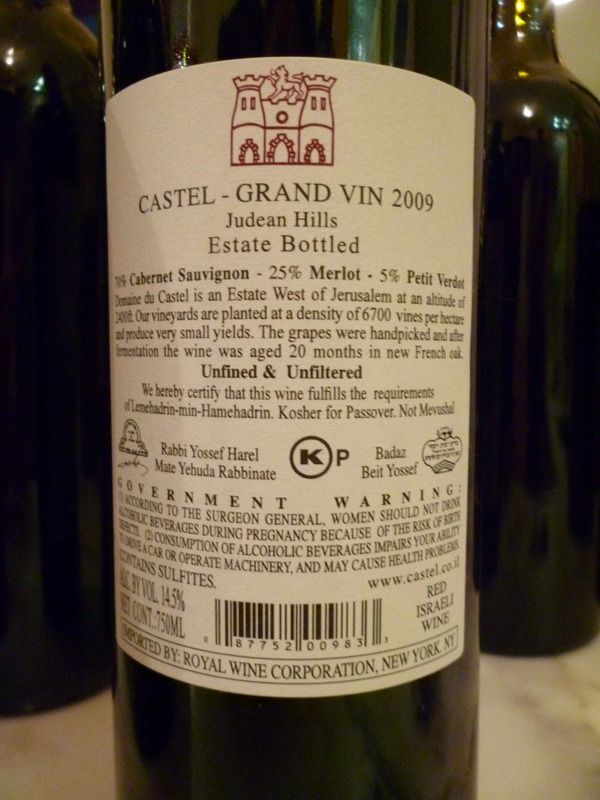 Posted on December 1, 2012, in Food and drink, Israel, Israeli Wine, Kosher Dessert Wine, Kosher French Wine, Kosher Red Wine, Kosher Semi Sweet Wine, Kosher Sparkling Wine, Kosher White Wine, Kosher Wine, Wine, Wine Tasting and tagged besomim, Brobdingnagian, Cabernet Sauvignon, Capcanes, Champagne, Chardonnay, Chateau Leoville Poyferre, Chateau Pontet Canet, coalition, Covenant Winery, Domaine du Castel, Drappier, Four Gates Winery, grand vin, Grenache, Grenache Blanc, Landsman, Lavan, Makom, Napa Valley, Peraj Ha'Abib, Pinot Noir, Recanati Winery, saint julien, Shirah Winery, Special Reserve, Syrah, White. Bookmark the permalink. 9 Comments.